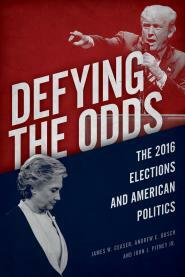 In Defying the Odds, we talk about the political impact of economic and regulatory policy. A major scientific report issued by 13 federal agencies on Friday presents the starkest warnings to date of the consequences of climate change for the United States, predicting that if significant steps are not taken to rein in global warming, the damage will knock as much as 10 percent off the size of the American economy by century’s end. The report, which was mandated by Congress and made public by the White House, is notable not only for the precision of its calculations and bluntness of its conclusions, but also because its findings are directly at odds with President Trump’s agenda of environmental deregulation, which he asserts will spur economic growth. But in direct language, the 1,656-page assessment lays out the devastating effects of a changing climate on the economy, health and environment, including record wildfires in California, crop failures in the Midwest and crumbling infrastructure in the South. Going forward, American exports and supply chains could be disrupted, agricultural yields could fall to 1980s levels by midcentury and fire season could spread to the Southeast, the report finds. Noam Levey and Evan Halper at LAT report ton regulatory and legal filings acknowledging multiple kinds of harm from Trump's deregulatory policies. The Department of Education, for example, did not report how many student borrowers would be affected by a proposed rule issued earlier this year making it more difficult for students who have been defrauded by colleges or universities to get debt relief. Nor did the agency report how much more debt these students could face. Only when borrowers sued did the agency acknowledge in court filings that scaling back the federal government’s debt relief program had left students with $56.9 million in additional debt. Similarly, the Department of Health and Human Services has been granting states permission to impose work requirements on Medicaid beneficiaries without any assessment of how many people could lose health coverage as a result. Many advocates fear that the administration may simply stop reporting potential adverse effects from their proposals. To date, however, agencies have acknowledged that several of the administration’s highest-profile policy shifts would likely cause significant harm. Nowhere has this been more apparent than at the EPA, an agency that has long set the standard for evaluating the costs and benefits of proposed regulatory moves. When Trump in 2017 ordered the EPA to scrap President Obama’s landmark initiative to fight climate change by limiting power plant emissions, agency scientists reported the move would cause up to 4,500 premature deaths annually.